Breeding new perennial grass varieties of willow and switchgrass with useful bioenergy traits for the Northeast drives NEWBio team. Shrub Willow Canopy. Photo credit: Armen Kemanian. Perennial crops dedicated to biomass production are just starting to be developed. Most existing varieties of potential feedstock crops, such as switchgrass, have been bred for use as forage or conservation. But new varieties with traits that bioenergy producers require, especially high yields of biomass, will be a boon to a growing bioenergy industry. Work by NEWBio’s Feedstock Improvement Team, led by Larry Smart of Cornell University, and Stacy Bonos of Rutgers University, is helping to develop those new varieties, with useful traits such as resistance to harmful insects and diseases. that perform better and can be grown on a wider range of marginal lands in the Northeast. NEWBio has focused on types of land that have low value for traditional crops, including reclaimed mineland, because selected varieties of willow and switchgrass have the potential to grow there and avoid competing with food and feed crops for prime land. By helping to commercialize these varieties, the team provides growers with bioenergy crops that produce more reliable yields and greater profitability. The team also developed genomic tools to accelerate the breeding of new varieties for high production, helping to ensure a thriving bioenergy future. The team’s shrub willow breeding program at Cornell University worked to capture hybrid vigor by crossing diploid and tetraploid varieties to produce sterile, triploid offspring. Triploid species hybrids can yield more biomass than diploids and tetraploids, and new selections outperform current commercial varieties. The team’s efforts produced more than 10,665 novel seedling individuals by completing 187 crosses, which produced 92 shrub willow families, 80 of them new. Team members established selection trial of willow hybrids to evaluate more than 270 new progeny, and established trials on eight sites in four states, including two on reclaimed mineland, to evaluate the new willow varieties. Meanwhile, the team is testing entire families to determine the best individuals to use in future crosses, which will continually improve genetic resources. Controlled pollination of willow. Photo credit: Larry Smart, Cornell University. The team has continued to expand its collection of willows by acquiring new lines from collaborators, nurseries, and arboreta, including 99 new willow lines collected from natural stands in Germany and Poland and a family of willows native to Bulgaria. The growth traits of many of these lines were evaluated in contrasting environments, and the genes that control those traits were mapped. Those traits, useful in developing new varieties for the biomass industry, include stem height, stem number, and stem diameter; wood chemical composition; leaf nitrogen in response to fertilizer; and rust severity. The team will use these genomic markers for early selection of lines with improved performance without the need for expensive, long-term field trials. The Cornell University willow team relied on natural pollinators to perform crosses in the field, collecting triploid and tetraploid seed in open-pollinated crossing blocks. This method encourages greater genetic recombination and overcame technical barriers due to the short-lived nature of the large tetraploid female catkins that often cannot be supported by cut shoots in hydroponic culture in the greenhouse. To date, about 1,500 seedlings from 16 families have been recovered and established in nursery beds, awaiting further evaluation. Addressing disease and pest problems in perennial feedstocks through breeding is an important step in developing a profitable biofuels industry, because it is not sustainable to use pesticides as a management tool. The researchers investigated the genetic basis for resistance to several pests and diseases that affect willow and perennial grasses, with a goal of producing new varieties with improved resistance. Potato leafhopper is a highly damaging pest on certain species of shrub willow bioenergy crops. The team conducted studies of captive potato leafhoppers on willow hybrids, using genome sequencing to identify the genes involved in the different responses of resistant and susceptible varieties. Knowing the genes that protect willow from potato leafhopper damage provides tools for early selection of resistant varieties in the breeding program. Leaf rust of willow is considered the most serious disease affecting intensively managed willow plantations in North America and Europe. Breeding for willow rust resistance was established through NEWBio, and will expand as part of a new USDA NIFA funded project. 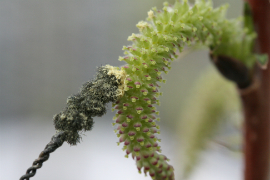 Rust resistance genes will be mapped in eight species hybrid families, each with S. purpurea lines that already have extensive genome sequence data as one of the parents. Anthracnose disease on switchgrass has been on the rise in recent years. Team research found that lowland switchgrass is more tolerant to anthracnose disease compared to upland switchgrass and that resistance is strongly controlled by genes rather than the environment. In addition, 16 switchgrass varieties were evaluated for resistance to anthracnose, with and without fungicide application. Since no fungicides are currently labeled for disease resistance on switchgrass, multiple fungicides were evaluated to provide adequate control of anthracnose in order to determine the impact of anthracnose disease on biomass potential. The fungicide-treated plots had significantly less anthracnose severity; however anthracnose had little effect on biomass yields. Cornell researchers confirmed that willow triploid species hybrids outperform diploid and tetraploid varieties, by evaluating 28 varieties in 21 North American locations. One of those top-performing varieties, ‘Preble,’ has been patented or received plant breeder’s rights in the United States, European Community, and Canada for its improved yields and pest resistance. The team found that willow varieties that are high-yielding under optimal field conditions also produce improved biomass quality. By managing for improved yields through fertilization or site improvement, producers could also see improvements in biomass quality that will result in greater conversion efficiency to biofuels. The researchers discovered that ash and hemicellulose content vary more due to the choice of variety, while yield, cellulose, and lignin content are largely influenced by environmental factors. Biomass with greater content of hemicellulose and cellulose is likely to yield more biofuel, while ash and lignin tend to impede conversion to biofuel. The research was one result of examining the effect of environment on the biomass composition of varieties grown in trials funded by NEWBio and a Department of Energy feedstocks project. The Feedstock Improvement Team evaluated 144 breeding lines from Rutgers and Cornell Universities for biomass yields, finding 15 superior breeding lines. he team chose 45 individuals most suited to each environment: upland and lowland ecotypes for both the Northeast and reclaimed mineland environments. Reclaimed minelands, with their heavily compacted and rocky soils, provide harsh conditions for crop establishment and growth. Through research trials in West Virginia and Pennsylvania, the Feedstock Improvement Team identified practices and varieties which are providing the foundation for ongoing breeding and improvement of biomass crops for mineland production. 10 willow varieties show the best survival on reclaimed minelands, of the original 24 that were evaluated. Willow site preparation alternatives and soil amendments, such as spent mushroom compost, show promise for improved establishment on reclaimed mineland. 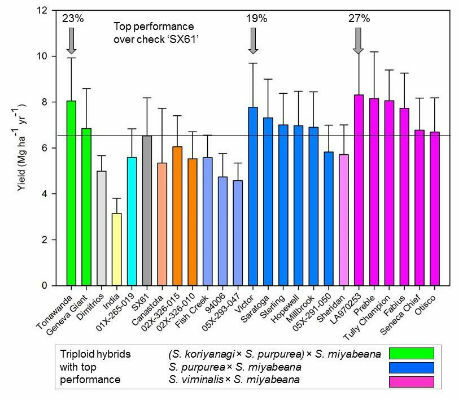 45 higher performing switchgrass ecotypes were identified for each upland and lowland ecotype from the original 144 breeding lines that were evaluated. A thriving bioenergy industry in the Northeast begins with high-yielding biomass crops that grow well in our region. The Feedstock Improvement Team’s work in developing varieties of switchgrass and shrub willow that producers can grow successfully and profitably strengthens the industry’s foundation and improves its future prospects. Lines produced through breeding and selection in this task are likely to improve yields by 20% over existing commercial varieties. Much of the team’s work aimed at growing bioenergy crops on marginal land, especially reclaimed mineland, of which there are 1.2 million acres in three Northeast states alone. Just as important, the team established the genetic resources and tools for breeding more successful varieties down the road, ensuring that producers will always have access to the high performing biomass crops they need. Fabio, E.S., Volk, T.A., Miller, R.O., Serapiglia, M.J., Gauch, H.G., Johnson, G.A, van Rees, K.C.J., Labrecque, M., Amichev, B.Y., Hangs, R.D., Kuzovkina, J.A., Ewy, R.G., Kling, G.J. and Smart, L.B. Gan, H.Y., Gan, H.M., Savka, M.A., Triassi, A.J., Wheatley, M.S., Smart, L.B., Fabio, E.S., and Hudson, A.O. 2014. Genome Announcements. 2(3):e00288-14. DOI: 10.1128/genomeA.00288-14. He, X., Zheng, J., Serapiglia, M.J., Smart, L.B., Shi, S., Wang, B. 2014. Silvae Genetica. In press. Kenaley, S.C., Smart, L.B., and Hudler, G.W. 2014. Fungal Biology 2014 Aug;118(8):704-20. doi: 10.1016/j.funbio.2014.05.001. Marra, M., T. Keene, J. Skousen, and T. Griggs. Serapiglia, M.J., Gouker, F.E., Smart L.B. 2014. BMC Plant Biology 2014, 14: 74. DOI:10.1186/1471-2229-14-74. Serapiglia, M.J., F.E. Gouker, J.F. Hart, F. Unda, S.D. Mansfield, A.J. Stipanovic, and L.B. Smart. Serapiglia, M.J., Mullen, C.A., Boateng, A.A, Cortese, L.M., Bonos, S.A., Hoffman, L.
Serapiglia, M.J., Mullen, C.A., Smart, L.B., and Boateng, A.A.
Hoffman, L.H., L.M. Chaves, E.N. Weibel, H. Mayton and S.A. Bonos.